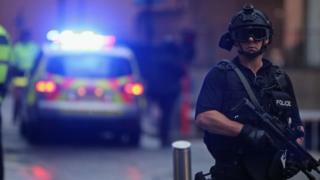 However, the UK's security services said extreme Islamist-based terrorism remained the country's most pressing national security concern. In the aftermath of the Christchurch mosque shootings in New Zealand, "Simon" - who worked as a counter-terrorism specialist for the Home Office - said the north of England faced a growing danger from far-right extremists and neo-Nazis. "We've got former mill towns and cities across the north where this ideology, that white people are supposedly superior to everyone else, is growing and becoming more entrenched. "I've no doubt that there are far-right extremists across the north who are planning to use violence to target Muslim or Jewish communities. "They'll harbour the ambition to copy what happened in Christchurch. He added: "We've already seen in Yorkshire how this extreme ideology has been used to target members of Parliament." Labour MP Jo Cox was murdered in her West Yorkshire constituency in 2016 by Thomas Mair, who was described in court as a lonely Nazi sympathiser. Image caption Jo Cox MP represented in the constituency of Batley and Spen. She was murdered in her constituency in 2016. Prof Matthew Feldman, director of the Centre for Analysis of the Radical Right, said the threat of right-wing extremists carrying out an atrocity in the UK similar to the Christchurch shootings remained low. "The biggest barrier to the far right, is the fact that in the UK we have extremely tight gun laws." "The far-right do represent a threat to some communities in our country, but more often than not, these are people who are alone online, radicalising themselves, so they don't have a direct support network that could help them to gain access to weapons." Statistics from the government's counter terrorism programme Prevent shows that regions in the north accounted for the highest number of initial referrals for right-wing extremism in 2017-18. The number of religious or racially motivated hate crimes in England and Wales, increased from 37,417 in 2013-14 to 79,587 in 2017-18, according to the Home Office. Labour MP Naz Shah said there was a definitive link between a rise in levels of hate crime and support for extreme far-right groups. "We've seen across the country a rise in Islamaphobia and race hate crimes - this hatred is fuelling support of the far right," the Bradford West MP said. "I've been talking about this problem for years, and it is a growing issue and one that I don't think the government is talking seriously enough." Addressing the House of Commons earlier this week, Security Minister Ben Wallace acknowledged far-right extremism was a growing problem. He added that the UK's counter-terrorism strategy was designed to address all forms of terrorism, whatever ideology it was driven by, and funding would be directed "wherever the threat emerges". Det Ch Supt Martin Snowden, head of Counter Terrorism Policing North East, said his officers had brought a number of successful prosecutions against extreme right-wing suspects in recent years. "We are committed to tackling all forms of toxic extremist ideology which has the potential to threaten public safety."